Fehr Trade has been one of my favorite blogs for a long time, especially for pattern magazine reviews, but Melissa has really outdone herself with these two new pattern releases. 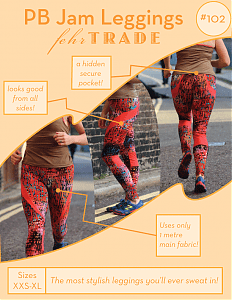 The leggings description says “the design lines carry around the sides so you look good from all angles” which is something SO many RTW leggings patterns overlook, and they have a hidden back pocket big enough for keys and a cell phone. 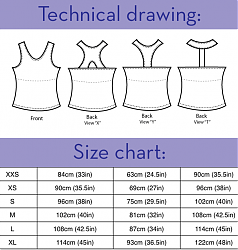 The top pattern has a built in bra which can be adjusted independently of the top, and the pattern testers (up to a DD!) seem to agree that it’s enough support without an additional sports bra. I may be making a lot of these! Serendipitous, right?! And, StyleArc has a running promotion where a specific pattern is free with any order, every month. I usually save my order for a month when I like the free pattern, so did this month’s make the cut? Gosh, yes. 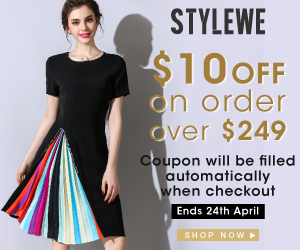 A side note to anyone not familiar with StyleArc patterns – they are located in Australia and shipping anything from Australia tends to be a little costly. It used to be about $12 (depending on the exchange rate) to ship 1-3 patterns, plus your monthly freebie, so I often put off orders until there were 3 patterns I wanted. However, they just started a new “Discount International Postage” option for one pattern (plus your freebie) that is only about $6, so for under $20 you can get two patterns with shipping. Not too shabby! It’s one of those drawings where you’re not sure if the real life garment would be really awesome or really hideous. (Care to make a guess?) Open comment to Vogue: WHY do you sew up and provide pictures for the most basic patterns (this release: a circle skirt and a gathered skirt?!) and give us only line drawings for the patterns I haven’t seen anything like before. Help us out a little more here! French pattern company Deer and Doe graciously released a free t-shirt pattern for their followers a few days ago, and then followed it up by announcing a contest where you can win gift cards for their pattern shop and fabric. How generous! I have a lot of t-shirt patterns, but I like how this one has a little bit of an A shape instead of being tight fitted. Three sleeve lengths and optional elbow patches are also included. How about you, any of these new patterns on your list? Or something else I missed? Also, I really like the skirt! The ladies from Paprika pattern actually come from the Netherlands, and that’s where I live too. 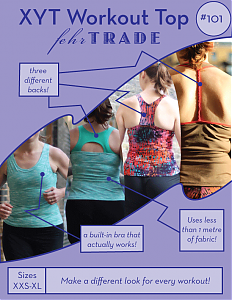 While I think the adjustable bra T-shirt is pure genius, the two Vogue patterns you featured are the ones I keep going back to. Thank you for giving me a reason to go to the fabric (pattern) store :). I think I’ll be willing to take a chance on the line drawing pattern. IF successful, I’ve found a classic-with-a-twist summer staple. Yay! You’ll have to share pics if you make it first! Inquiring minds want to know. 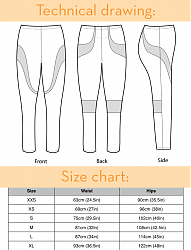 I’m really interested in making my own leggings. Cold weather running gear can cost a small fortune, so I’m really interested in making some for my colder runs. Some of these companies I’ve never heard of. Thanks for making my to-sew list longer! I am too. I have one pair I’ve been wearing for about 10 years that is very similar to the Fehr Trade pattern (fleece lined, reflective material where the stripes are, and a back pocket), but they were kind of a splurge when I was running a lot in sub-zero temperatures and I think they cost me about $100. I’d really like to have a few more pairs, but not at that price!